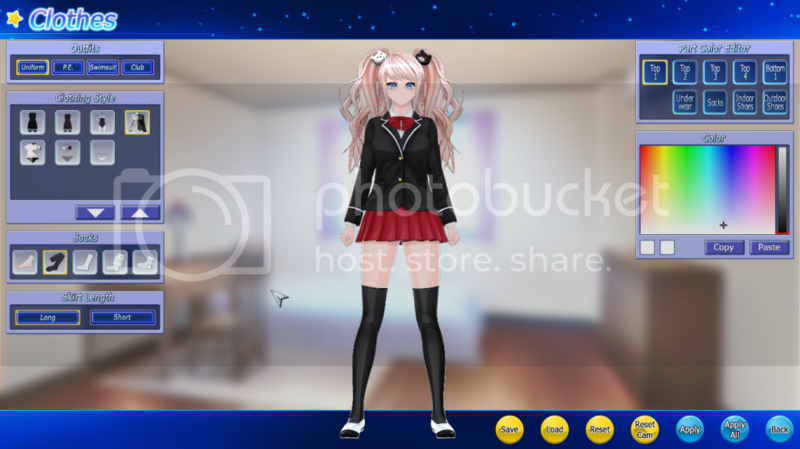 The only real difference between the junko outfits from the others (aside from the skirt in the Uniform outfit) is that they includes colored fingernails. The icons (I'm guessing) are probably that way, because it would be difficult to illustrate colored nails on them. Last edited by Flegel; 11-07-2014, 04:00 AM. Because it is a rather large mod that can mess up your game if installed incorrectly, it would be best to always remove the previous installation before hand. You should try forcing the mod again through the wizzard. This work is amazing, I wonder if it's possible to make a hot pants outfit, it will be great. I hereby request for the inclusion of the Blazer/Tightskirt/Pantyhose/No Tie outfit. Apparently SVII has it, but MKII doesn't. Last edited by Hurahara; 11-07-2014, 11:35 AM. Monokuma is sad that the colors didn't help indicate. You will have to rename the texture folders for the moved slots. See readme for info on texture folders. On the bright side, the SVIICC texture collection is now compatible with this version, so you could just grab that. I figured as much, beforehand, so I just went ahead and uninstalled/reinstalled. Thanks, anyway! Seeing the newest update, looks like I'll be doing that, again. *B̶t̶w̶,̶ ̶I̶ ̶c̶a̶n̶'̶t̶ ̶s̶e̶e̶m̶ ̶t̶o̶ ̶f̶i̶n̶d̶ ̶t̶h̶a̶t̶ ̶S̶V̶I̶I̶C̶C̶ ̶t̶e̶x̶t̶u̶r̶e̶ ̶c̶o̶l̶l̶e̶c̶t̶i̶o̶n̶ ̶a̶r̶o̶u̶n̶d̶ ̶h̶e̶r̶e̶.̶ ̶D̶o̶ ̶y̶o̶u̶ ̶m̶e̶a̶n̶ ̶j̶u̶s̶t̶ ̶t̶h̶e̶ ̶f̶o̶l̶d̶e̶r̶ ̶a̶r̶r̶a̶n̶g̶e̶m̶e̶n̶t̶s̶? Found it within the SVIICC Mega download section...of course it was obvious, lol. Last edited by tmvaegis; 11-07-2014, 09:25 PM. Look at the sides and the stripes in the middle. Is this what the outfit is supposed to look like? >> The shadows on it are like that in every shot so I'm kind of confused. ^ Yeah, I have the same problem with the outfit. No idea what the cause is though. I heard it's caused by clothing taking up the same slot. Uninstall hexa (and delete the leftover files), grab latest hexa and install I think. Hm. Delete The leftover files related? And than reinstall with new version? Alright. . . Will try it out. What is jg2p01_00_SVII_C.pp file? It from clothing hexa mod?